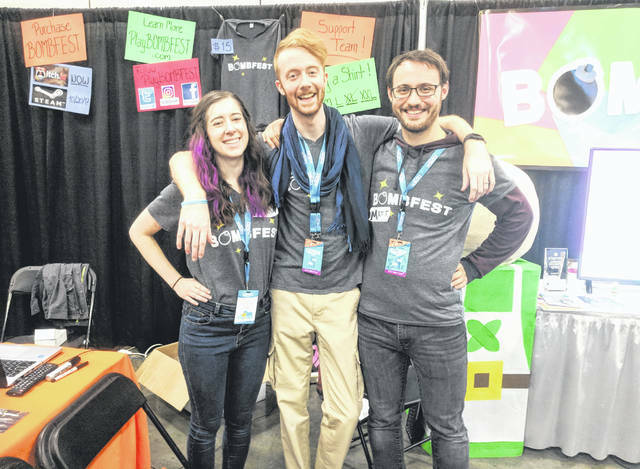 McClain High School graduate Marisa Hike (left) is pictured with Zachary Pierce (center), the lead developer for the new video game Bombfest, and Matthew Trowbridge, the game’s sound effects artist. They are shown showcasing the game at the Game Developers Expo (GDEX) in Columbus, where they won the Crowd Favorite Award. This is a screen shot of the new video game Bombfest that McClain High School graduate Marisa Hike helped develop. Marisa Hike never imagined being a video game programmer. But that was before a high school college fair. Now, less than six years after graduating from McClain High School, she and her work partner have developed a new game called Bombfest that is available for download on consoles including Nintendo, Xbox, PlayStation and personal computers. 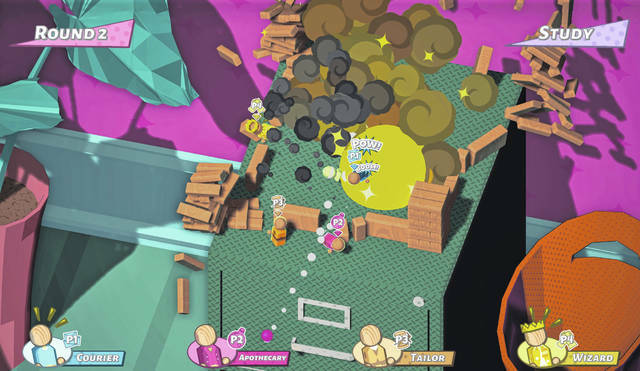 Bombfest is a four-player party game with blocks, toys, bombs and explosives, Hike said, with players earning points as they go along until one player is left standing. That player receives more points, but is not necessarily the winner of the game. While she played video games during her free time growing up, Hike said she spent more time with church-related activities, show choir, symphonic choir, National Honor Society, art club, Tigerettes, Hi-Y and plays and musicals during her school years. But it was at a college fair during her senior year at McClain that she happened onto the field of game programming. She graduated from Shawnee State in 2017 with a degree in gaming and simulation arts, but said the path to where she is now was an unusual journey, and that often she was one of a few, if not the only, female in a class. While she was in college Hike did some volunteer work at a gaming conference in Columbus. That’s where she met Zachary Pierce. They became friends, he hired her to do some 3D art for his Sudden Impact Studios LLC, and now Hike is a partner in the business. But it was not like video games were foreign to Hike in her younger years. In fact, she said that when her brother Jonathon was around 8 and she was 4, their parents bought him a Gameboy. She played it a lot, too, and one time accidentally saved over part of her brother’s Pokemon game. “That was when my parents said, ‘Let’s get her one of her own,’” Hike said. For Bombfest, Hike said she did all the aesthetics for the game and created the 3D models. Pierce was the programmer and designer. They commissioned someone else to do the sound effects, then ended up finding a publisher. Today, Hike lives in Columbus and works remotely with Pierce. She said she has normal daily work hours, with specific times scheduled to work with her partner. She said game programming is a tough field to get in to, but encouraged those interested in it to follow their dreams.